UPI Performance, a high performance V-Twin engine shop out of Ashland, OH has joined the Star Racing family of partners as primary sponsor of Rookie of the Year candidate, Chaz Kennedy and as an associate partner with 3-time Champion Angelle. “Our belief with Chaz Kennedy is that he is a young rider with the drive and talent to be a future champion,” stated UPI Performance owner Scott Smalley. Twenty year old Chaz Kennedy, in his rookie season of NHRA Pro Stock Motorcycle competition, has started to see progress in his results. 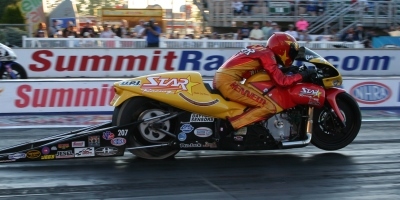 At the rain delayed Pep Boys NHRA Carolina Nationals Saturday at Texas Motorplex, Kennedy made it to the semi-finals winning his second round match-up on a holeshot.